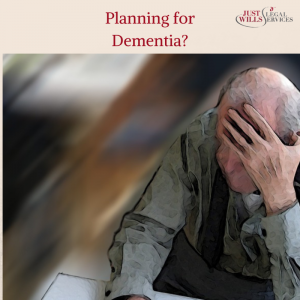 Should we be planning for dementia? That’s a daunting statistic that most of us don’t want to dwell on and we live in the hope that somewhere in the not too distant future, medical science will triumph and find a cure. However as no one knows what’s around the corner it is paramount you put concrete plans in place to ensure that you are physically looked after in accordance with your wishes and that your family can take your place and deal with your financial affairs should the worst happen. Of course Dementia isn’t the only cause of losing “mental capacity”, mental health issues, a stroke, an illness or brain injury can also contribute to your loss of mental capacity. Understand information relevant for making a specific decision. Weigh up the arguments and make an informed decision. Retain knowledge and thoughts about information relevant to making a specific decision. In this article we look at why and how you should plan incase you lose mental capacity. If you suddenly lose “mental capacity” then your loved ones will NOT be able to access your finances or make decisions about your welfare on your behalf, even if it’s to pay for your future care. It’s a myth that your spouse will be able to walk into your bank and draw out your money whether it is to help towards everyday living expenses, or fund your treatment. Without a Lasting Power of Attorney in place they do not have the legal authority to deal with your financial affairs and /or health and welfare. Instead they will have to apply to the “Court of Protection” to become a “deputy”. A deputy is very similar to an attorney with one crucial difference: Anyone who is eligible can apply to become a deputy, the person who has already lost mental capacity does not consent, or have any say in the matter, when it comes to who is appointed. The risk here is they may not know you well enough to know what you would have wanted. Of course your loved ones can go the court and apply to become a “deputy” to act on your behalf, but this can be costly and very time consuming. It could be months before the court appoints a “deputy” and in the meantime managing your day to day affairs cannot be done by anyone as you wait for the court to make the decisions on your behalf. This is a legal document where someone gives the right to other(s) to make decisions on their behalf. The person handing over the rights is called a “donor”. It should be set up whilst the donor still has mental capacity – therefore it’s best to be prepared earlier on. It’s VERY important to note that you CANNOT set up a Power of Attorney when you have lost mental capacity. It must be set up whilst you have capacity. The person who is given power of attorney is known as the “attorney” and must be over 18 years old. Property And Financial Affairs LPA. The attorney will be able to handle and make decisions about your money, property and assets. This will include things like paying bills, and selling your home. Once set up, it can be used immediately. Health and Welfare LPA. The attorney will have the power to make decisions in regards to your everyday life. This will mean handling medicine, helping with daily routine such as washing and could even mean making the decision to move you into a care home. Once set up it can only be used when the donor loses mental capacity. Having Lasting Power of Attorneys in place can give everyone involved piece of mind that the people who have been chosen as attorneys are trusted and actively desired by you to look after your affairs. It can mean a smooth transition from you the “donor” to your attorney. Your attorney can then act on your behalf to carry out your wishes, and act in your and your families best interests. Here at Just Wills and Legal Services we can take you through the process of setting up an LPA every step of the way. In consultation with you we will analyse your circumstances and ensure that you fully understand the implications of making an LPA. This will give you and your loved ones the peace of mind that, should the time come you have the right documentation in place to enable your attorneys to handle your affairs on your behalf and for your benefit. This article is for general information only and does not constitute legal advice. You should not rely on this information to make (or refrain from making) any decisions. Always obtain independent, professional advice for your own particular situation.